From 31 August 2016,​ the first of the new Platinum vehicles have been operating on the operator’s 529 service between Wolverhampton and Walsall. More Platinums on the 126 service between Wolverhampton and Birmingham and our X10 service between Merry Hill and Birmingham are being rolled out through the autumn. “This latest £8 million investment means that during 2016, we are introducing nearly 100 new Platinums in the West Midlands. When the roll-out is finished, these luxurious new buses will be carrying passengers in every district in the Black Country. Built in Britain by Alexander Dennis Ltd (ADL), Platinums are lighter and more fuel efficient than conventional buses and their Euro 6 engines are among the cleanest in the world. Platinum buses were first introduced in May 2015 across Birmingham, Solihull, Coventry and Walsall - on the 900, 957, X51, 997, 934, 935, 936 and 937 routes. 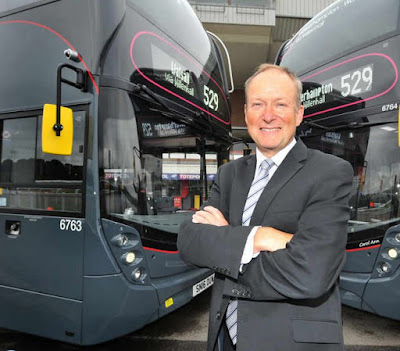 The £34 million fleet of 58 buses brought passengers free WiFi, extra leg room and high-backed comfy seats. When passengers were asked what they thought, overall satisfaction across all the Platinum routes was 94%. The new Black Country Platinums have been made to an even higher spec, and are fitted with USB chargers in the seat backs and alloy wheels. National Express Platinum drivers have extra training and wear a special Platinum uniform. And they are loving their new buses. The new buses are all named after female relatives of National Express staff, and “Carol Ann” is named in honour of Nigel Matthews’ late mother-in-law. Other Platinum features which make National Express drivers happy include a Probax driver’s seat cushion to improve posture and comfort; and the new Sideriser 2 seat pedestal with a simpler adjustment mechanism, which allows drivers to note their preferred settings and dial them straight in. Platinums also have automatic headlights and saloon lights. They are all Low Carbon Certified - dramatically reducing local air pollution as well as cutting carbon emissions by a third, compared to the old Tridents they're displacing. To achieve this, the new buses all have stop-start technology, 'smart accessories' that reduce the power drain from the engine, and weight savings - hence the alloys, which save the weight of an average man.